Firearms provide protection and defense to those who bear them. Return the favor. Drago Tactical Weapon Cases are designed to optimally secure and protect long guns, and come equipped with multiple storage areas to efficiently organize ammunition and accessories. Padded backpack straps for hands-free transport. Three large pouches for ammunition and accessories. Four zippered storage areas. Two padded pistol pouches. MOLLE front panels allow attachment of load-bearing equipment. Hook & Loop panel for patch. If you have any questions about this product by Drago, contact us by completing and submitting the form below. If you are looking for a specif part number, please include it with your message. 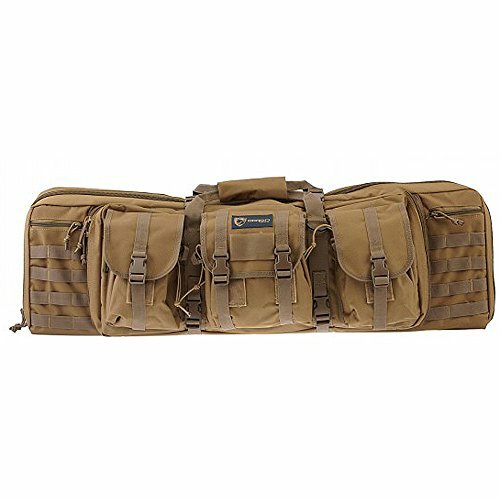 Allen Company Shadow Shotgun/Youth Gun Case, 32"
U.S. WWII Fleece Lined M1 Garand Case - Marked U.S.
U.S. WWII Fleece Lined M1 Carbine Case with Carry Strap - Marked U.S.